PM NARENDRA MODI OPENS PRAVASI BHAVAN - SAYS "BRAIN DRAIN" CAN BE CONVERTED TO "BRAIN GAIN"
DIWALI STAMP, AT LONG LAST. On Gandhi Jayani (Oct. 2nd), Prime Minister Narendra Modi said the issue of "brain drain" can be converted into "brain gain" if the nation started looking at the 27-million-strong Indians living abroad spread across the world as a strength rather than a number at the opening of the first Pravasi Bharatiya Kendra in New Delhi, for overseas Indians as a landmark step in India's effort to engage the Diaspora. The Pravasi Bharatiya Kendra is a state-of-the-art complex dedicated to overseas Indians. 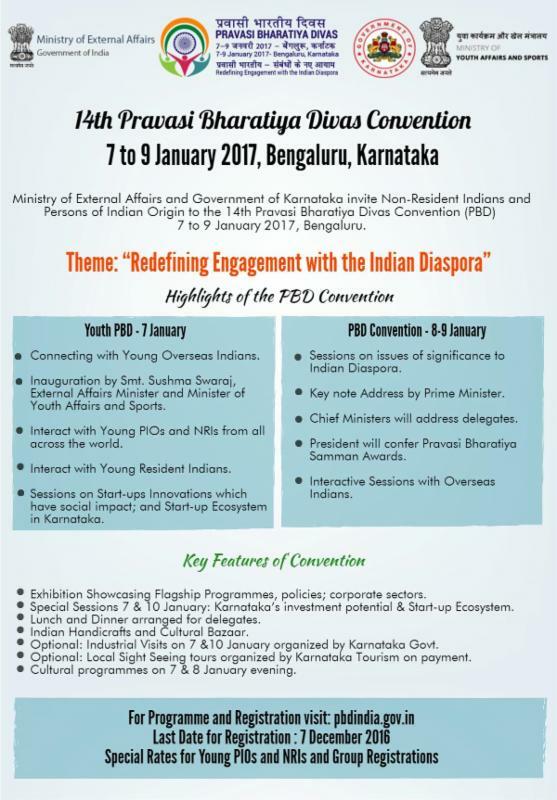 "In more than 150 countries we've presence of Pravasi Bhartiyas. They are a huge strength for our Missions," he added. Noting that the world was more keen now than earlier "to engage with India", he said: "In such times 'fear of unknown' can be an obstacle. Our Diaspora can help overcome this. They just have to tell the world that we belong to India." The Prime Minister stressed on the need to connect with Indians living abroad and hailed his predecessor Atal Bihari Vajpayee who "coined idea of Pravasi Bhartiya Divas and it has been continued since then". 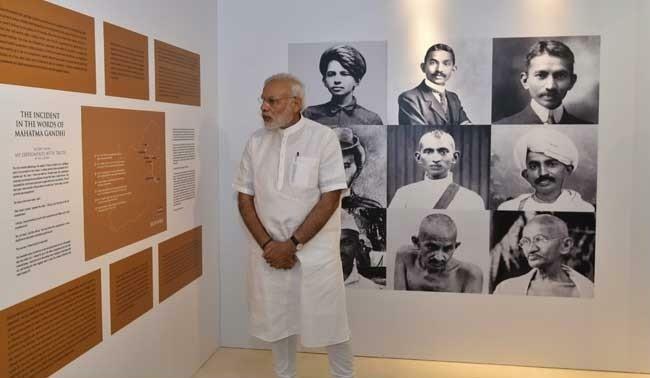 PM Modi also said that it was very appropriate to inaugurate the Pravasi Bharatiya Kendra on October 2, the birth anniversary of Mahatma Gandhi. "Gandhiji had left India but the call of the nation brought him back. Nothing can be a bigger inspiration than this," he said. "Pravasi Bharatiya Kendra shows what it means to be an Indian, the meaning of association with India." 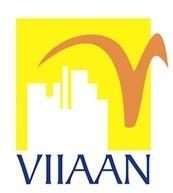 "It is home to 27 million PIOs (Persons of Indian Origin) and NRIs (Non Resident Indians). It can act as a focal point for even those Pravasis who are still searching for their roots in India," said PM Modi. GOPIO International is planning to hold its annual Community Service Awards (CSA) Banquet on the evening of January 6, 2017 in Bengaluru, India as the concluding event of GOPIO Convention 2017 - Bengaluru. Nominations are to be submitted using the prescribed form with supporting documents by November 30, 2016 to Chair, GOPIO CSA 2017 Selection Committee gopiointl.awards@gmail.com. NRIs, former NRIs, PIOs and those with children/parents and siblings living abroad and have interest in the NRI/PIO affairs and staying in the Delhi National Capital Region (NCR) are invited to attend. Contact Chapter President and GOPIO Life Member Dhiraj Ahuja, 09717112272, globallinkoverseas@yahoo.co.in. October 5, 2016 will go down in the history of the Indian American community as the day when the United States Postal Service (USPS) released the Diwali stamp. This was in response to the demand from Indian Americans for a stamp commemorating Diwali. The dedication ceremony of the Diwali postage stamp was held at the Consulate General of India, New York. It was attended by the Consul General Riva Ganguly Das, Congresswoman Carolyn Maloney, Diwali Stamp Project Chair Ranju Batra, USPS Vice President for Mail Entry and Payment Technology Pritha Mehra, India's former Permanent Representative to the United Nations Ambassador Hardeep Singh Puri and many members of the local Indian American community. Attorney and community leader Ravi Batra served as the master of Ceremony. Many petitions from Indian organizations were collected for this stamp and with the support of some US Congressmen, in 2015 a US Senate Resolution 113 was introduced, "Expressing the sense of the Senate that the Citizens' Stamp Advisory Committee should recommend the issuance of, and the United States Postal Service should issue, a commemorative stamp in honor of the holiday of Diwali." This stamp release was the culmination of the untiring efforts of many Indian Americans and truly worthy of pride. GOPIO-Paris Nord organized Welcome and Integration Day for new students from India joining various institutions in the Paris area. "Home is where your heart is, home is where our story begins, there's no place like home and it takes hands to build a house, but only hearts can build a home," said GOPIO Paris Nord President Mehen Poinoosawmy. It's very hard for young students to leave their homeland and come to adapt to a new way of life in Paris. In the past 5 years students leaving India for higher studies to France have increased skyrocket. A lot of exchange programs have been developed between India and France. Newly arrived students used to attend events and social gatherings to get and to find answers to their questions and make new friends. In order to give a warm welcome to the students from India for the academic year 2016-2017, the GOPIO France Paris thus organized the "WELCOME DAY" on the Saturday 17th September 2016 with the help of Director of Maison de l'Inde, Shri Rakesh Sharma and supported by the DCM of Embassy of India in Paris, Shri Mahesh Bhatt. The students were welcomed by Mehen Poinoosawmy, President of GOPIO France Paris and Honorary President Dr Vimal Khosla who are both settled in France since long time after having studied and joined French companies for their careers. The event allowed students to understand the French administration system as well as job & internships process in France. Panelists shared their experience and valuable ideas with the students: GOPIO Youth Council Europe Coordinator Nisha Dhingra, Dhiraj Bhatia from the Centre de Recherche Institut Curie, Krishna Shivalingaya (Capgemini) , Vikas Talwar (Accenture) and Jonathan Sinivassane ( Paris and Co, Invest). Since all of them were students in India and France, they clearly give a lot of hints and ideas for the way to success in France. Since very long time ago, France has been a favorite destination for scientists, artists, writers from all over the world and many have made it their home. France is the 4th most popular destination for international students and its high quality of education makes it an attractive destination for Indian students. This "Welcome Day" was organized for the first time and GOPIO France Paris promised to make it an annual event and has suggested it be organized GOPIO chapters in other countries. Contact: Mehen Poinoosawmy, President, GOPIO Paris Nord and GOPIO Intl. Life Member, Tel: +33 670468885, mpoinoos@gmail.com. 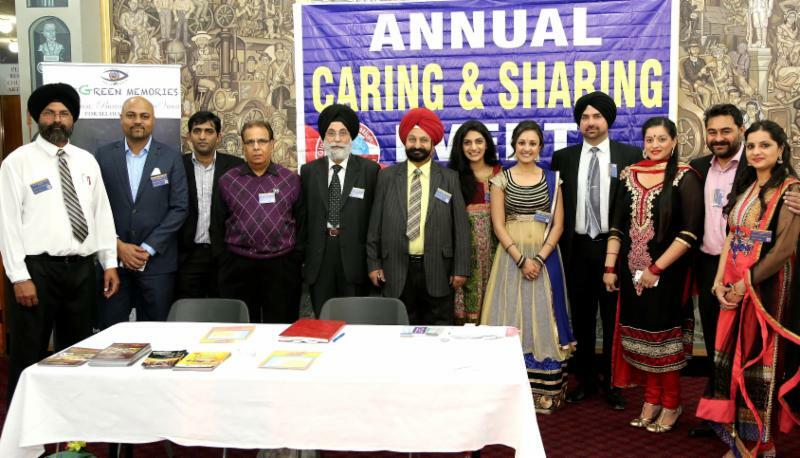 The 7th annual "Caring & Sharing" event of GOPIO Sydney North West chapter will be held on November 19th, 2016 at Bowman Hall, Blacktown (Sydney). GOPIO Sydney North West chapter provides basic amenities to disadvantaged school children in remote areas of Punjab and Haryana (India) with the help of funds raised in "Caring & Sharing" events to bring a smile on the faces of the kids. Over 3000 children have benefitted in the last seven years. Locally GOPIO Sydney North West chapter has donated money to Australian Heart Foundation, Cancer Council, victims of floods in Fiji, for the improvement of facilities for seniors in Sydney, for fire victims and many other places where natural calamity has occurred such as the Nepal earthquake. The chapter also provides financial assistance to individuals, who need help in crisis. 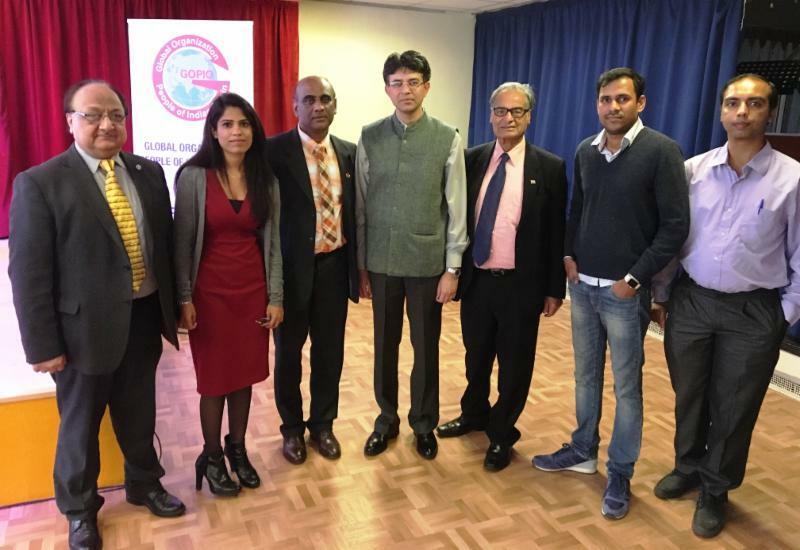 Photo: GOPIO Sydney-NW chapter team members at its 2015 program held at Bowman Hall, Blacktown, Australia. L-R: Baljit Pelia, Sumit Joshi, Sanjeet Hooda, Baljinder Singh, Prof. Balkar Singh Kang, Harmohan Singh Walia, Tia Singh, Amrit Buttar, Paramjit Multani, Aman Singh, Ravi Singh and Neeru Singh. GOPIO Durban chapter joined hands with Democratic Development Program (DDP) organized a seminar on Rights Violations on September 17, 2016 in Durban, South Africa with Dr Rama Naidu as facilitator and Dr Krishna Naidoo as speaker. 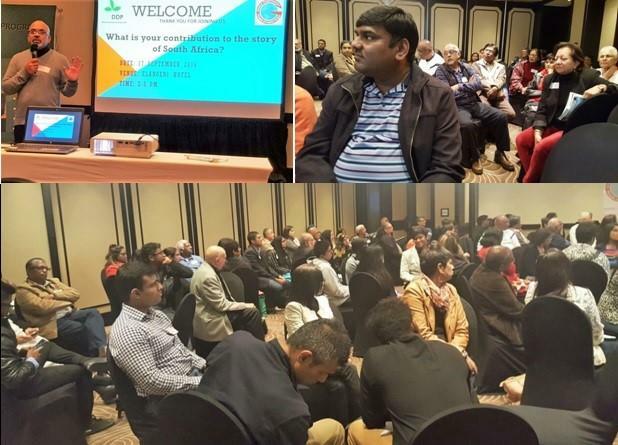 The fact that 75 people attended the GOPIO / DDP meeting in wet, miserable weather conditions was a clear indication of the desire to discuss and explore issues concerning Indians in South African and the need to be proactive and constructive in plotting a path forward towards a more democratic, non-racial, non-sexist South Africa. GOPIO Durban has had many such events or had joined other organizations on occasions to march against on Human Rights Violations or added value to a specific issue. The PIO community members have been very concerned about a specific issue regarding Indians in SA at the moment. A young African named Phumlani has been causing problems of racial divide through his organization and targeting Indians more specifically. The Convener Dr. Krish Naidoo and panelists spoke about the art of constructive dialog and conversation, after which the participants were split into groups. The participants in each group practiced the art of listening, sought clarification, (if needed) and then commented on what was discussed. Since each person was asked for an opinion, not only were everyone's opinions obtained but each person had to take ownership of their feedback. Many genuine and valid concerns were raised in these discussions, such as the prevalence of crime, educational concerns, tender allocations, concerns, etc. The participants learnt that incomplete information can lead to faulty perceptions. For instance, the perception that African children are not as committed as Indian children, does not consider other factors, such as socio-economic challenges, lack of resources at schools, child-headed households, etc. As a result of these discussions, the participants realized that effective dialogue helped to eliminate misconceptions and generalizations. Many of them realized that each person could contribute as an individual, as well as through organizational activities. After attending this program, they were inspired to further explore the benefits of constructive and meaningful dialogue in all spheres of their live. 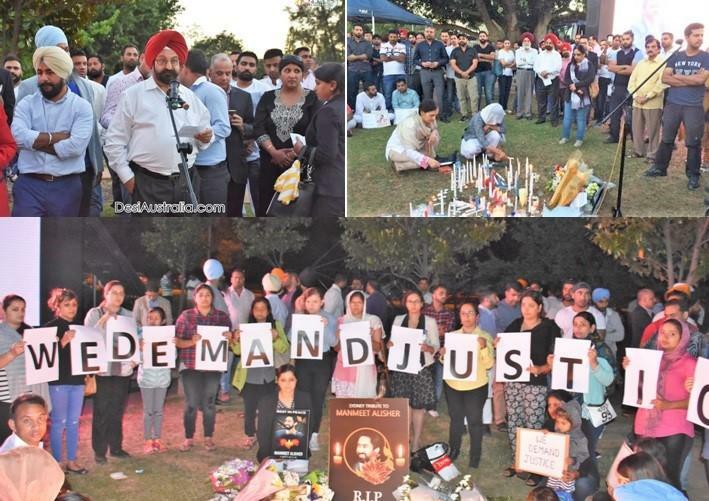 GOPIO-SYDNEY NW JOINS SYDNEYSIDERS PAYING TRIBUTE TO MANMEET SHARMA "ALISHER"
A large number of Sydneysiders gathered at Robin Thomas Reserve, Parramatta on Wednesday, 2 November 2016 to pay tributes and hold a candle light vigil for Manmeet Sharma "Alisher" , 29, a young aspiring writer, singer, actor, active community member and a proud Australian citizen, was brutally set ablaze last Friday, 28 October at Moorooka in Queensland. There were thoughts, prayers, grief and tears as the community mourned the loss of a young life by a senseless attack. There was nothing more painful than this incident and the whole community stood united as if Manmeet was their blood and soul. GOPIO Sydney North West chapter and GOPIO Brisbane chapter have pledged to donate $1000 each to the family of Manmeet Alisher. GOPIO was represented by Prof. Balkar Singh Kang, president GOPIO Sydney North West chapter, Harmohan Singh Walia, Sumit Joshi, Ravi Singh and Neeru Singh. The attack was strongly condemned and prayed for Manmeet's soul to rest in peace, and May God give strength to his family and friends to bear the loss. One minute silence was observed and ardas was performed. As this was a horrendous crime in anybody's language, the community demanded full justice with sign boards in their hands as the culprit should be punished with full force of the law. The first news flash in the media on the day of the incident was that Anthony O'Donohue, the suspect, who burned the Queensland bus driver to death at the wheel was just sitting at the scene, casually saying absolutely nothing other than "I want a lawyer". The defense lawyer Adam Magill said, he held concerns for his client's mental health. "He's numb, I don't think he's feeling anything at this point in time," Mr Magill said as per the news. Mental health issue was raised by the lawyer Adam Magill only. The community is asking questions that if Anthony O"Donohue is mentally sick, then how could he plan such a heinous crime, where no other person was attacked except the young Indian. Is it a sign of a mentally sick person? If he has mental health issues, then why was he not under supervision. Photo above: GOPIO-Sydney NW participates in memorial tribute to Manmeet Sharma "Alisher"
Many migrants shared their anger and frustration at comments made on them in their day to-day life, such as "Go back to your country" etc., while going to work, in trains or in shopping centers. The common consus was that the Australian government should amend their laws to deal with such situations, so that hate crime can be stopped. An Indian-origin scientist has bagged the prestigious Lemelson-MIT Prize worth USD 500,000. This prize honors outstanding mid-career inventors who improve the world through technological invention and demonstrate a commitment to mentorship in science, technology, engineering, and mathematics (STEM). With more than 75 patents to his name, and having authored more than 120 reviewed publications, Raskar is the co-inventor of radical imaging solutions, including Femto-photography, an ultra-fast imaging system that can see around corners; low-cost eye-care solutions for the developing world; and a camera that allows users to read the pages of a book without opening the cover. He now plans to use a portion of the prize money to launch a new effort using peer-to-peer invention platforms that offer new approaches to help young people in multiple countries to co-invent in a collaborative way. US President Barack Obama has nominated a 47-year-old Indian-American woman attorney to the US District Court bench in New York. If confirmed, Diane Gujarati will be the first Article III Judge of South-Asian descent in New York. Gujarati has been the Deputy Chief of the Criminal Division of the US Attorney's Office for the southern district of New York since 2012. From 2008 to 2012, she served as Deputy Chief and later, Chief of the White Plains Division of the United States Attorney's Office. From 2006 to 2008, Gujarati was Deputy Chief of the Appeals Unit in the Criminal Division of the United States Attorney's Office for the Southern District of New York. Ravi Reddy, an Indian-origin South African, has become the first person from the African continent to head a global organization of medicine professionals, working for the safety of blood transfusion. Currently the Chief Operations Officer of the South African National Blood Service (SANBS), Reddy will head the International Society for Blood Transfusion (ISBT), headquartered in Amsterdam. The ISBT was established in 1935 as a platform for exchanging knowledge and advancing blood-transfusion practices. Reddy's campaign to ensure stringent testing and education among donors is important, since South Africa has a high incidence of HIV/AIDS. "Mr. Reddy has played a key role in South Africa's high level of blood safety," said Raju from SANBS, who stated that there has been only one confirmed case of HIV caused by blood transfusion out of nine million units of blood donated in the past decade. Reddy began his career at SANBS as a volunteer and later qualified as a medical technologist with an MBA from the University of Natal in South Africa. He represented the African region on the board of the ISBT and is also a member of the Working Party on Transfusion and Transmissible Infections. He has presented and published a large number of scientific papers. Lord Narendra Babubhai Patel, an Indian-origin, British obstetrician and member of the UK Parliament has been awarded the Lifetime Achievement Award by Asian Business Publications Limited (ABPL)for his work in the medical profession and for being an incredible role model for social justice and equality for the less fortunate. The Asian Achievers Awards are organized by ABPL every year to honor British Asian achievements across different fields. The other winners were Selva Pankaj, CEO of Regent Group, a London-based education skills and training development group; Manjit Gill, CEO of Binti, a social enterprise that works for women's causes in India and Africa; and Paralympian Ryan Raghoo, a long jumper who suffers from cerebral palsy. "This is a celebration of the enormous contribution British Asians make to our country. We see their success in sports, in enterprise and running of multi-million-pound businesses, media, public services and our Armed Forces," British Prime Minister Theresa May said in her message for the awards event. This event raised 180,000 pounds through a live auction for Indian Ocean Disaster Relief, to provide immediate relief and long-term projects in case of natural disasters. "This is a real honor. It feels like the bigger the award, the less deserving we may be," said Patel, who is a member of the House of Lords and also serves as Chancellor of the University of Dundee. Singapore-based Indian-origin businessman, Sunny Verghese has joined the Business and Sustainable Development Commission, which aims to help accelerate sustainable growth in agri-business. The Business Commission's mission leverages rigorous research and real-world examples to persuade business leaders to seize upon sustainable development, as the opportunity of a lifetime. It endeavors to show how the UN Sustainable Development Goals (SDGs) provide the private sector with a framework to address major developmental challenges. They aim to end hunger and poverty, reduce inequality and tackle climate change by 2030. Verghese, co-founder and CEO of Singapore's agri-business group, Olam International Limited, joins other leaders from the private sector, academia and civil society, who are committed to accelerating the world's transition to inclusive and sustainable growth. He feels that by putting sustainability at the heart of their business, Olam can live up to its name, which means "enduring". This drives Verghese's core purpose of "growing responsibly", thereby pursuing profitable growth in an ethical, socially responsible and environmentally sustainable way. According to Lord Mark Malloch Brown, Chair of the Business Commission, "Sunny's leadership in agri-business will be essential to increase the number of leaders who understand the incredible opportunity for both growth and sustainability in this sector." Two Indian-American scientists, Manu Prakash and Subhash Khotare among 23 scientists who have won this year's prestigious MacArthur Fellowship for exceptional creativity in their respective fields. It includes a stipend of USD 625,000, given over five years, designed to give the recipients the flexibility to pursue their activities in absence of specific obligations. Prakash, an alumnus of Indian Institute of Technology (IIT), Kanpur works as an Assistant Professor in the Department of Bioengineering at Stanford University. According to Stanford President, Marc Tessier-Lavigne, Prakash harnesses a wide array of technologies, including optical physics, computer science, fluid dynamics, biology and chemistry, to solve tangible human and scientific problems. Prakash attributes his ideas to growing up in India. According to him, "Being in the field gives meaning to working in global health. It teaches you empathy, a driving force so strong that it transforms ideas into actions." Khotare, an alumnus of IIT Mumbai, is a theoretical computer scientist at New York University and has a Ph.D. from Princeton University. The MacArthur Foundation stated that Khotare's work provides critical insight into unresolved problems in the field of computational complexity and that his ingenuity and tenacity will drive this important and fruitful area of research for many years. Ahilan Arulanantham, a Sri Lankan-American was also one of the receipts of this award. As an attorney working to secure the right to due process for individuals facing deportation, he has expanded immigrant detainees' access to legal representation and limited the government's power to detain them indefinitely. He plans to donate his USD 625,000 prize for the welfare of immigrant children. Abraham Verghese, an Indian-American physician and author has been awarded the National Humanities Medal, America's highest humanities award by US President, Barack Obama for his contribution to medicine. This National Humanities Medal "honors individuals or groups whose work has deepened the nation's understanding of the human experience, broadened citizens' engagement with history, literature, languages, philosophy, and other humanities subjects". According to Stanford University, Verghese has a reputation for his emphasis on empathy for patients in an era in which technology often overwhelms the human side of medicine. Verghese was born in Addis Ababa and began his medical training there. After working for a brief period in the US, he completed his medical training in Chennai, India at Madras Medical College and later returned to the US for a medical residency. Currently a professor of medicine at the Stanford School of Medicine, Verghese also directs the Stanford interdisciplinary center, Presence. He has also authored several books including 'My Own Country' and 'Cutting for Stone'. Seven teenagers of Indian origin were among the 20 young people who were recognized by the Davidson Institute with fellowships for their breakthrough discoveries that have potential to benefit society. They are Meena Jagadeesan of Naperville, Illinois. Sriharshita Munsunuri of Mill Creek, Washington, Anurudh Ganesan of Clarksburg, Maryland, Raghav Ganesh of San Jose, California, Maya Varma of Cupertinio, California. Surabhi Mundada of Olympia, Washington and Kavita Selva of Houston, Texas. Davidson Fellows not only represent some of the brightest young minds in the country, but they also represent kindness, compassion and a strong desire to improve the world around them. Many of their projects are inspired by personal experiences that drove them to find solutions to problems. This has inspired them to use their passion and intelligence to make the world a better place. For instance, Anurudh Ganesan, as an infant in India, had to be carried 10 miles to a remote health clinic to receive a vaccination. When he and his care-givers arrived at the clinic, there were no viable vaccines left because they could not be refrigerated. Fifteen years later, Ganesan realized that this is still a serious problem, and created VAXXWAGON, a non-electric vaccine transport system. Now his aim is to see VAXXWAGON in the field, actively saving lives. His invention can not only safely store and transport vaccines but can help many remote villages that need the scarce resources that are often used for vaccine transportation, such as water and electricity. A medical researcher, a widely publicized author, a committed social worker and above all, someone Indian Diaspora can be really proud of, is Dr. Nupur Kohli. She was born and brought up in the Netherlands and is a physician at the Academic Medical Center, Amsterdam. After completing Fundamentals of Business at Harvard Business School, she aspired to improve decision making, productivity and profitability in societies, businesses and the corporate world, by reducing stress. - How successful people maximize productivity and handle the extreme stress that comes along with it. - How a stress situation in one profession is perceived as a no-stress situation in another profession. - How stress affects employees in different positions and professions and how it affects the productivity. - Scientific research articles on mental and physical health of Surinamese and people of Asian origin in the Netherlands. This was published in the Journal of Hypertension, the official journal of International Society of Hypertension and European Society of Hypertension. - Article on travel health that was published in Global Medicine (a magazine on global and public health) in September 2013. Dr. Nupur Kohli is also a renowned versatile global speaker. She has delivered more than 60 speeches and had media appearances in Europe, Asia, Australia and the USA, where she has earned a reputation of a prominent woman speaker. She has striven to inspire, educate, motivate and provide solutions to people's problems. In 2012 she participated in a TED talk and won the TEDx Award in Delft, Netherlands. In her speeches, she has focused on not only medical but also on technology and social topics. - Empowerment of women, Motivation and positivity, Diaspora issues,especially problems unique to youth and women. Dr. Nupur Kohli has visited several hospitals in Delhi and Mumbai. This gave her the opportunity to examine the functioning of various departments, in many reputed Indian hospitals. She is working to share her knowledge and experience in Europe with her Indian counterparts to make medical care in India more efficient. She is a firm supporter of the Indian Diaspora in Europe and the Joint Secretary of the oldest Indian Diaspora Think Tank in the Netherlands, the Foundation for Critical Choices for India (FCCI). 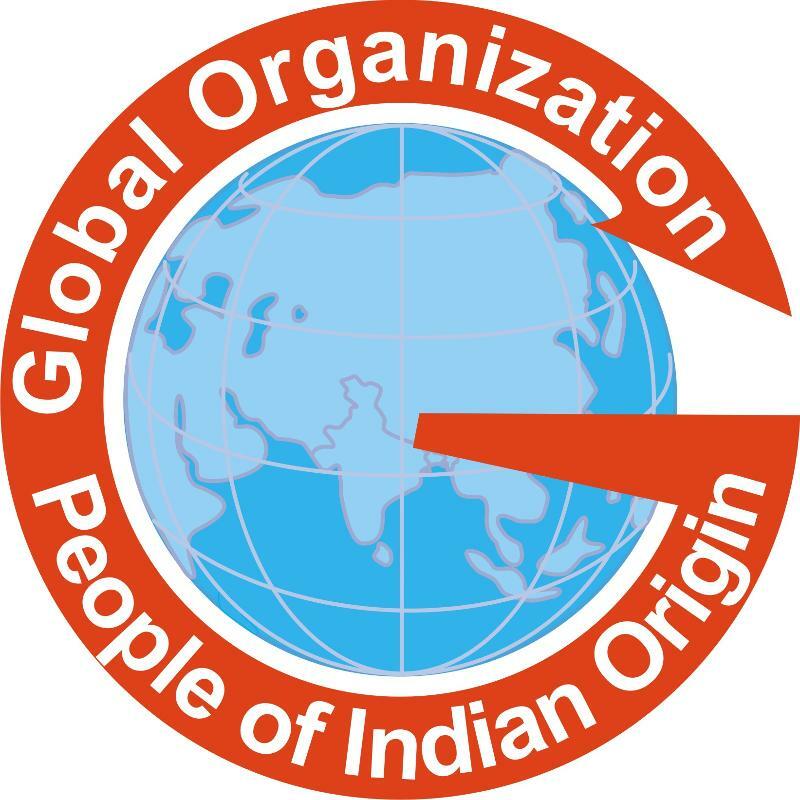 The FCCI is a focal point to initiate and implement studies and programs of strategic importance to India in social, political, economic fields by mobilizing the resources of Non-resident Indians (NRIs) and Persons of Indian Origin (PIOs). She was a member of the organizing team of the Indian Diaspora events in the Netherlands, including the regional Pravasi Bharatiya Divas Europe in 2009. Dr. Nupur Kohli is also the founder of Indian Diaspora Youth Association in the Netherlands (INDYA). INDYA is a youth Think Tank which studies and organizes events pertaining to the issues of Indian Diaspora Youth in Europe. Her significant research in medicine, her social commitment and her desire to improve the lives of many people, can be summarized in one of her favorite quotes "No job is unimportant. No person is insignificant. And as we each express our natural genius, we all elevate the world." The National Academies of Science, Engineering and Medicine in its report, "The Economic and Fiscal Consequences of Immigration" has refuted the claim that immigrants are a drain on the US economy. On the contrary, immigrant workers have contributed almost USD 2 trillion in 2015 - 16. After examining the fiscal and economic impact of immigration, this report shows that immigrants make valuable contributions to economic growth, innovation and entrepreneurship in the US. In addition, this report forecasts that in 2020 - 30, labor force growth will "depend completely on immigrants and their US-born descendants." Although Republican presidential candidate, Donald Trump feels that illegal immigrants "compete directly against vulnerable American workers", his Democratic rival, Hillary Clinton has said immigrants contribute to the US economy, whether they are legally in the US or not. According to this report, although first generation immigrants are costlier to governments than the US citizens (mainly because they earn less and pay less in taxes), the second generation is better-educated, pay more in taxes, and are strong economic and fiscal contributors. Three Indian-origin businessmen were honored for their contribution to society at the Annual Dinner of Friends Circle International, presided by Navtej Singh Sarna, the Indian High Commissioner to the UK. They were Dr. Rami Ranger, Atul Pathak and Krishan Ralleigh. Sarna said that though the Indian community accounts for only 2 per cent of the population, it contributes 6 per cent to the country's GDP and therefore plays a significant role in building bilateral relations. While complimenting the 1.5 million strong Indian community in the UK for their positive contribution to the British society, Sarma stated that India was the third largest investor and one of the major creators of jobs in the UK. Dr. Rami Ranger, a leading businessman who has won Queen's award eight times, received a shield in recognition of his services to the community and business. He leads two of Britain's fastest growing companies with an annual turnover of more than 200 million pounds.